Virgin Bingo is all about having fun. They offer the best games to suit every need, whim and want, as well as loads of bonuses and exclusive prize giveaways. Grab a great bonus and start playing today. Everyone is familiar with the world famous Virgin brand so you can be sure that you are signing-up to a quality bingo site. Players are guaranteed great fun, fantastic games and most importantly, a realistic chance of winning bingo. Virgin Bingo is a safe place to play and there are no worries about payouts. 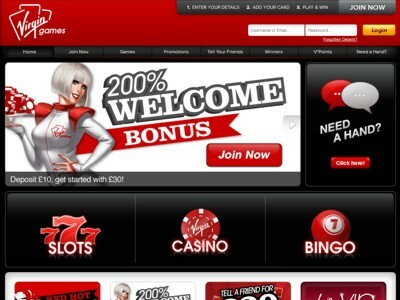 Virgin Games offers both 90 ball and 75 ball bingo options. Besides bingo, players can play a wide range of slots, scratchcards, table games, keno, and video poker at this UK bingo site. You can look forward to some very generous prize money up for grabs, with huge jackpots guaranteed daily you will not be disappointed. They also have huge progressive jackpots available that offer massive cash prizes. Virgin uses Gamesys group to operate all the exciting Virgin Games on this website. Gamesys group is one of the leading UK online gaming businesses. You will be impressed by the fun, value for money, entertaining, quality, innovation, brilliant customer service and a sense of competitive challenge in a responsible, fair and trusted environment. As a member of the Virgin Community you will have access to the dedicated customer services team who promise to answer to individual inquiries within 2 hours. You can also contact them on their toll free phone or use live chat. There is a FAQs section for general inquiries. They also have a great team of chat hosts readily available to answer any players questions. Virgin has a great selection of free online slots. There are over 30 top branded slots games. No deposit is required to play the free games if you choose the free play mode. With no risk you can try out any of the games before you decide to make a deposit. Virgin Bingo is no longer promoting it’s bingo games. If you were looking for Virgin we now recommend that you check out Tasty Bingo instead. To find out more please read our Tasty Bingo Review. This bingo site has been tested, reviewed and approved. You are guaranteed to find one of the most fair and trusted sites in the UK! Loyalty Program: Earn 1 V*Point for every £5 you spend on Bingo or £20 you spend on Slots or Casino. Your V*Points can be redeemed for either cash or Virgin Flying Club Miles – you only need 20 points before you can start cashing them in! Virgin is one of the most trusted brands that you can find. The Virgin Games site continues in this tradition. The bingo games incorporating fun and fantastic bonuses and promotions that will keep you coming back. Deposit £10 Play with £30 at Virgin Bingo today!